Remember, sometimes less is more. 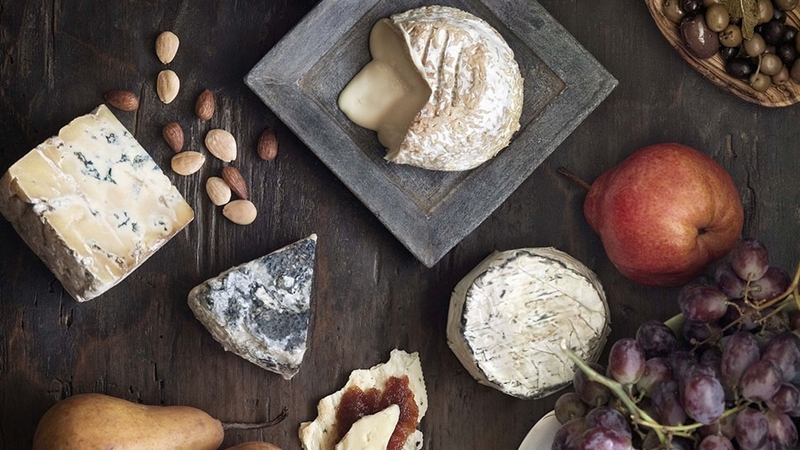 In the same way creating a cheese board is a craft in its own right, there's an art that goes into putting together the perfect charcuterie board. From storing and slicing the meats to finding spreads and garnishes that balance out the flavors of the charcuterie, it's easy to feel a little overwhelmed. 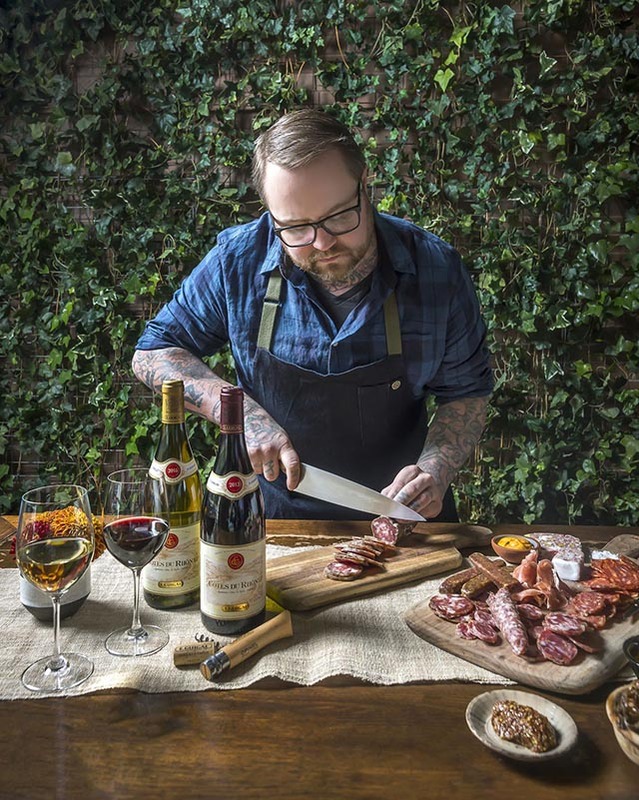 In order to make the process a bit more palatable, we enlisted the help of chef Jamie Bissonnette, who is the author of The New Charcuterie Cookbook and owner of popular Boston restaurants Coppa, Toro, and Little Donkey. 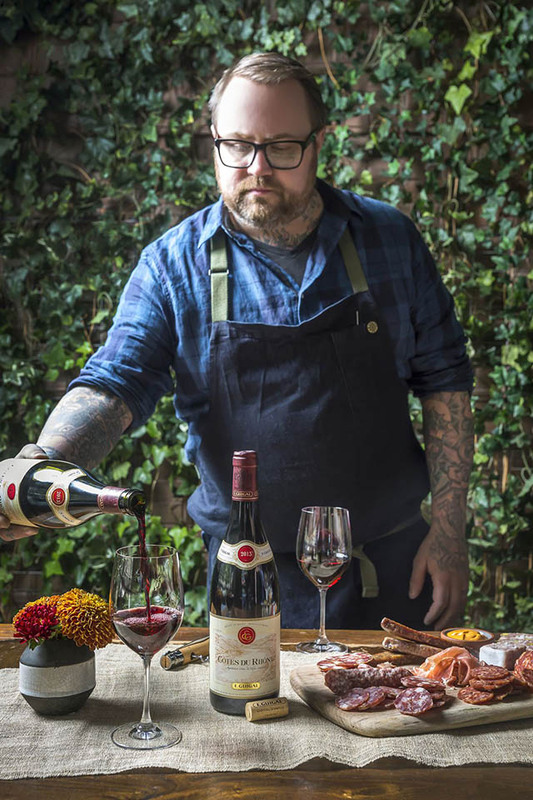 Bissonnette offered up some amazing tips, including how to pair charcuterie with Guigal wine, and even a few savory garnish recipes that are sure to impress your most finicky dinner party guests. 1. BE MINDFUL OF HOW YOU'RE ARRANGING THE MEATS. While it might seem a little intimidating to properly execute a charcuterie board, all it takes is a quick shopping trip and some prep time to create a board that is sure to impress. 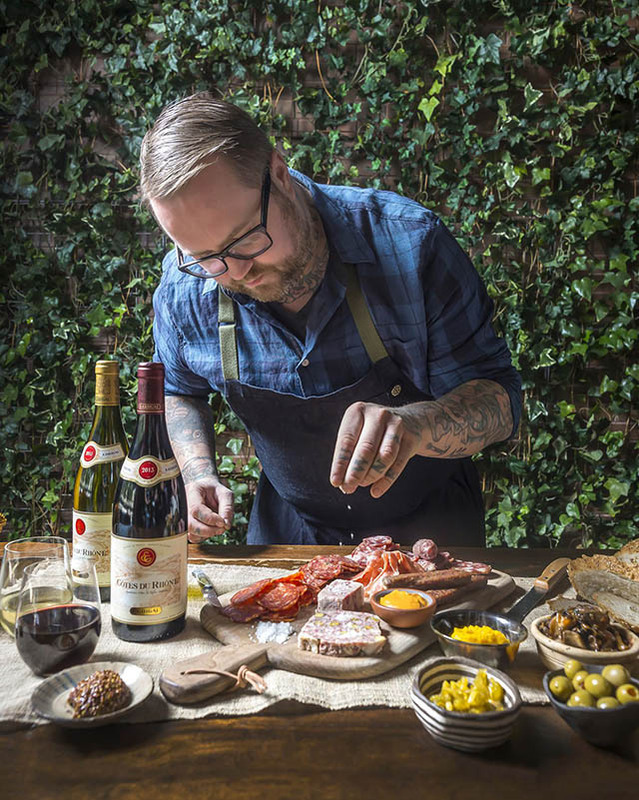 "I always say when plating charcuterie, mix and match where the meats are placed on the board," says Bissonnette. "For example, don't put all the sausages next to each other, or people won’t be able to remember what’s what. And as for variety, be adventurous! 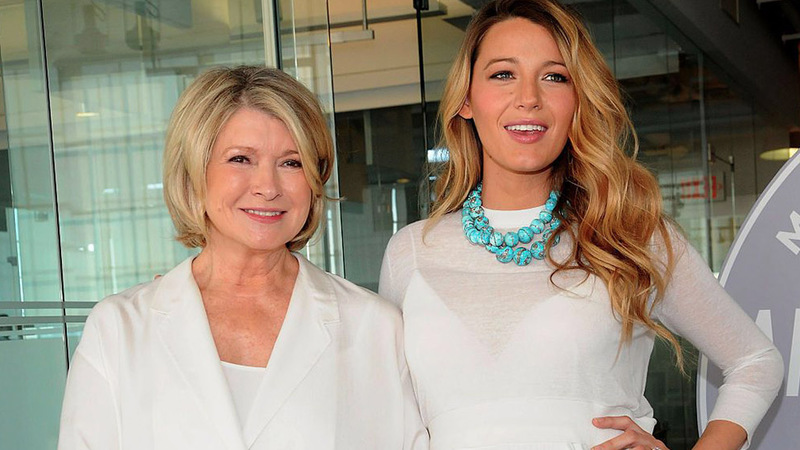 Play with styles and cuisines that you might not get at a restaurant." 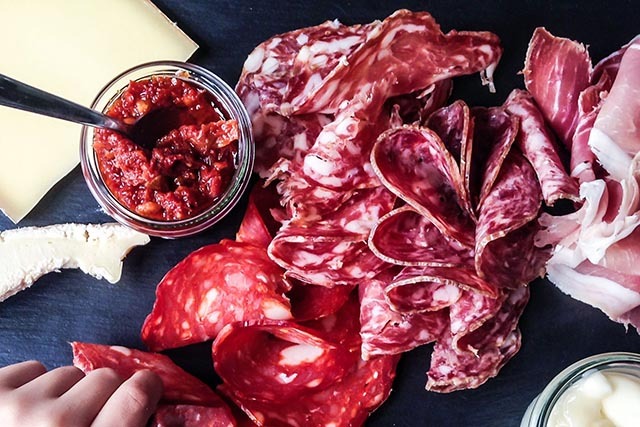 From ham and chorizo to saucisson, there's a wide variety of charcuterie to choose from and experiment with. 2. SLICE AND STORE ACCORDING TO THE TYPE OF MEAT YOU'RE USING. Saucisson — Hand-cut so slices aren't too thin. The texture of the meat brings out the flavor. Pate and Terrine — Cut to about the thickness of a pencil, and the same size as the bread or other bite-sized garnishes you are serving it with. Rillettes — Leave rillettes in their pots and allow them to come up to room temperature to make for easier spreading. Chorizo — Cut aged chorizo to about the thickness of a credit card. Ham — Cut ham slightly thicker than deli meat. The texture of a smoked ham adds to the flavor. Jambon de bayonne (Similar to Prosciutto) — For best consumption, cut the jambon as thinly as possible, making sure it does not stick together or tear up. Pro Tip: "One of the best things about a charcuterie plate is that you can make it ahead, up to an hour in advance. Just cover with wax paper so the items don't dry out. 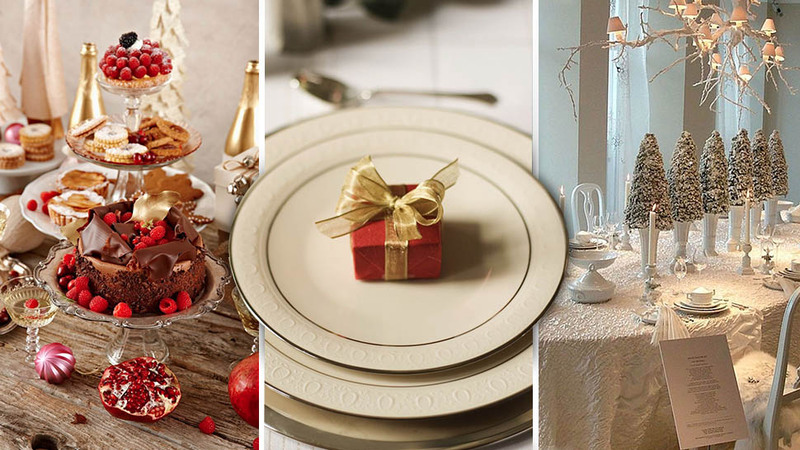 When ready to serve, unwrap and let it sit out for 10 minutes to come up to temperature." 3. BALANCE FATTY MEATS WITH TANGY GARNISHES. No matter how nice the board you serve your charcuterie on is, it all comes down to the flavors you present to your guests. For this reason, it's important that you balance out fatty meats with tangy garnishes to create beautiful flavors that work well together. Apart from typical garnishes like mustard and pickles, he also recommends balancing your board with sweet and sour celery, marinated mushrooms, marcona almonds, grilled bread, crunchy pickles, chestnut honey, and Romesco mustard. In addition to flavor, Bissonnette says these garnishes add complimentary texture and color to the charcuterie board. Place all ingredients except oyster mushrooms in a large rondeau pan and boil for 5 minutes before adding oyster mushrooms. Cook at a medium simmer for 45 minutes, stirring occasionally, until mushrooms are completely cooked and covered in liquid. Cool to room temperature and serve cold or store in the fridge for up to one month. 4. CONSIDER THE FLAVOR OF THE MEAT WHEN PAIRING WITH WINE. 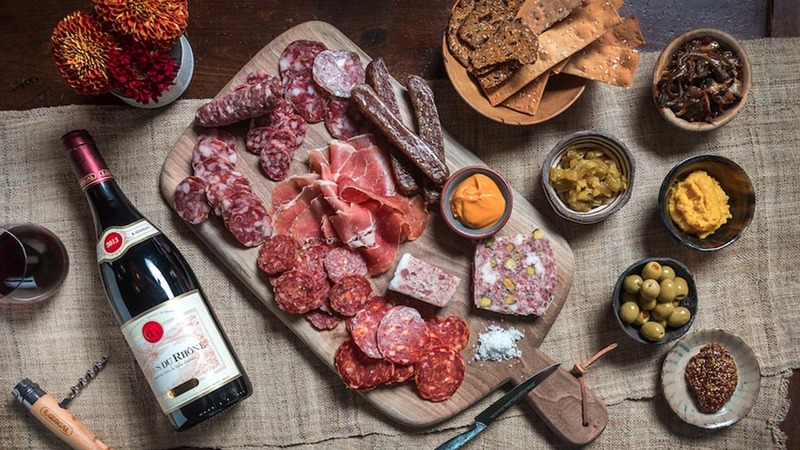 Pairing charcuterie with wine is all about balance. 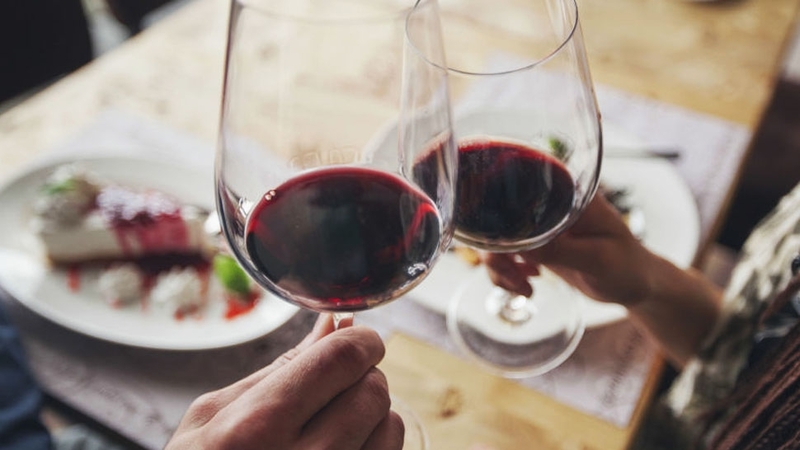 "I think rosé, unoaked whites, and well-balanced reds are awesome with the fat and salt and deep flavors of a cured meat, especially when they can bring interesting complementary fruit, floral and spice notes that tie together the meal," he says. 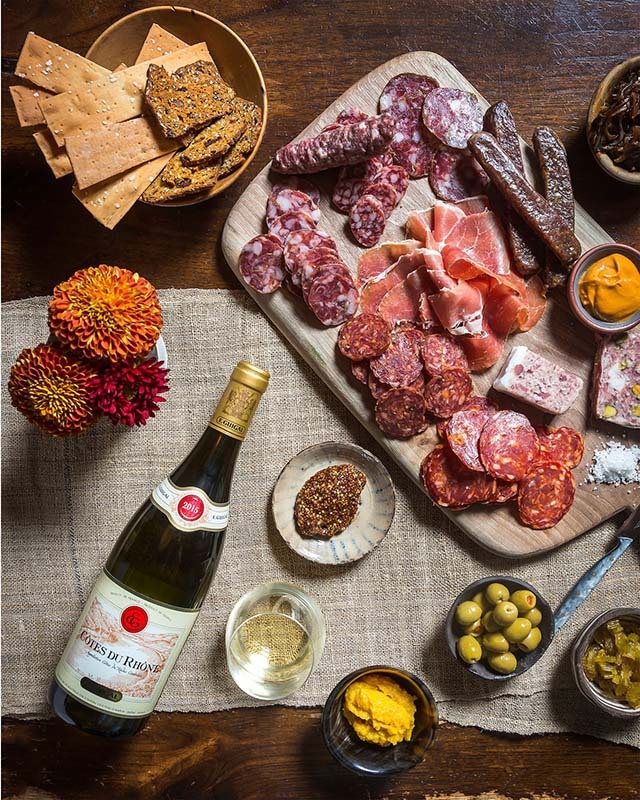 If you're not sure where to get started on your charcuterie and wine pairing endeavor, check out guigal.com to find the Côtes du Rhône Blanc and Côtes du Rhône Rouge, which pair nicely with a salty saucisson. 5. MAKE FRIENDS WITH YOUR LOCAL BUTCHER. 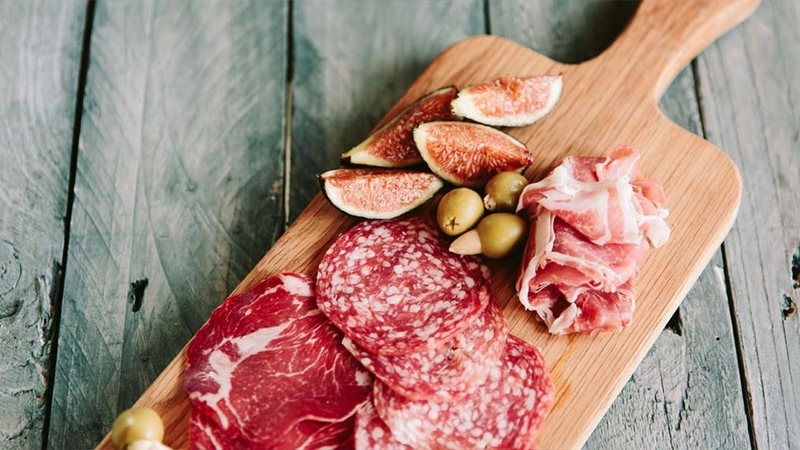 If you're truly interested in mastering the art of the charcuterie board, Bissonnette also shared some helpful tips for beginners looking to learn more about this branch of the culinary world. His first tip: make your own charcuterie at home. 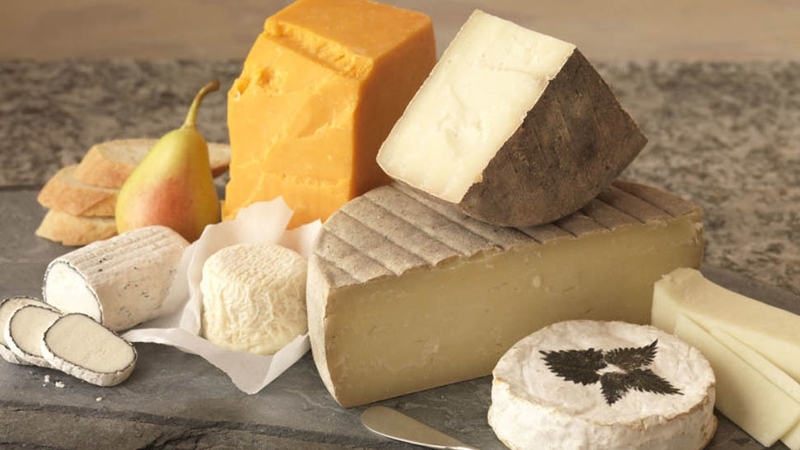 "Start with great raw ingredients — know where your meat is from and source heritage breeds," says Bissonnette. "Your butcher is your friend here. Ask what’s the best locally and what breed the animal is. When seasoning, taste the sample at the temperature you will serve it. If it's a pate, cook a sample, and cool it. Cold food will need more seasoning than hot food." Once you get to know your local butcher, you can find out what their favorites are — which might not be the everyday meats on the Italian and French restaurant charcuterie lists — and determine what you need to try. And you don't have to limit yourself to one butcher. "Stop by the local butcher when you’re traveling," Bissonnette says. "It’s a great way to taste the local flavor and the perfect setup for a hotel snack or picnic supplies." Be sure to check out Chef Bissonnette's restaurants Toro, Coppa, and Little Donkey on your next trip to the Boston area.